Not content with the LG’s G Watch R smartwatch which went on sale in October 2014 as noted in LG’s G Watch R smartwatch by the end of October in time for Christmas 2014, they’ve decided that this year, the Year of the Goat, was the year Apple got put down. 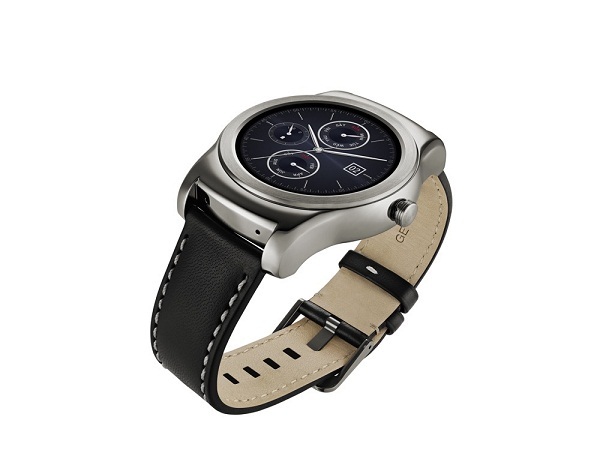 Because on Monday February 16th 2015, LG Electronics announced the successor to the LG G Watch R, the LG Watch Urbane smartwatch, which is set to make a splash come MWC 2015 (Mobile World Congress) in Barcelona, Spain on Monday March 2nd 2015. So says the news announced in their Press Release. Named to evoked a sense of sophistication that city-slickers will love, the LG G Urbane is part smartwatch and part fitness tracker. The LG Watch Urbane comes in silver and its entire body is made of stainless steel that cradles its electronics. The well-crafted stitched natural Leather strap can be replace with any 22mm wide band based on what you’re wearing, making this the most aesthetically pleasing smartwatch running Android Wear to date. It’s still got a circular Plastic 1.3 inch OLED (Organic Light Emitting Diode) display with a resolution of 320 x 320 and a comfortable-on-the-eyes 245ppi. But unlike its predecessor, it’s got a thinner profile with dimensions of 45.5 x 52.2 x 10.9mm. Narrower than it’s predecessor, the LG G Watch R is decidedly unisex and is comfortable on the wrists of both men and women. The LG Watch Urbane has an Always-On ambient mode that dims the display based on the surrounding ambient lighting conditions, thereby preserving battery life. Under the hood it’s powered by Android Wear and it’s compatible with Google Android smartphones running Android 4.3 Jellybean or higher. For the tech-oriented, it’s running on a 1.2GHz Qualcomm® Snapdragon™ 400 chipset that supported by a 512MB LPDDR2 RAM. The processor is powerful enough to handle a Gyroscope, Accelerometer and a Magnetometer aka a compass, tracking you in all three (3) degrees of motion and all your LG fitness Apps are stored in the 4GB eMMC Memory. Fancy knowing the weather in your location? The Built in Barometer will tell you if you need to carry your umbrella and when the sun is shining. With an eye on the weather, LG Watch Urbane is also a waterproof is rated at the IP67 for dust and up to 1 m of water, which probably means you can’t take this thing to the shower. But it can stand up to a good, sweaty workout, withthe PPG (photoplethysmography) sensor tracks your heart rate. The battery is kinda weak though, rated at 410mAh, which translates to less than a day’s worth of active usage. Worse, the price is estimated to be at least US$100 on top of the US$320 LG G Watch R, with pre-orders being accepted by UK retailer MobileFun for around US$442.99. Something tells me that this “fashion ova’ style” approach isn’t gonna cut it with these smartwatches, as they’re yet to even break the three (3) Day barrier on a full battery charge. These battery life concerns may be the reason why sales of smartwatches running Android Wear are not doing so well, with Google’s hardware partners, LG Electronics, Motorola Mobility and Samsung Electronics only shipping some 720,000   in all of 2014. Plus, all that frequent recharging is sure to run down the capacity of the Li-Ion Batteries. Still, this is just an estimate and the performance won’t be known until MWC where many will get a hands-on with the device to see if it’s performs as good as it looks and is a worthy Apple Watch competitor. The Wearables Industry needs the Apple Watch to be a success after they launch in April 2015. If the crowd likes an overpriced Apple Watch with NFC (Near Field Communication) and Apple Pay, then it’ll have a trickle down effect on Android Wear….once they can solve the battery life and aesthetics issues.